I’m standing in the buzzing lobby of the Grand Hyatt New York hotel in midtown Manhattan, looking around to see if I can spot a basketball player. It’s the afternoon of the NBA draft, and several of this year’s best college players have made their way to the ballroom on the mezzanine level. Players are always easy to spot in a crowded, open space, it turns out. If there’s a tight scrum of preoccupied people, the epicenter of the circle will likely be occupied by a tall, thin man-child. Their faces are either open and eager — or shaded and slightly defensive. They already have the requisite media aversion, and know to expect boring questions or intrusive indignities. Many are also becoming more familiar with the public hunger of their fans, who all want photos or a memorable Snapchat encounter. Some players have learned to just stand still for a moment, open their arms wide and bring the admirers in close on either side. Long enough to smile, dap someone up, acknowledge the love. Short enough to make it plain for everyone — these kids are already gone, just about outta here. In a few short hours, adulthood will be upon them. When Adam Silver, the NBA’s commissioner, shakes their hands on the draft stage at the Barclays Center and officially welcomes them to the league. These kids will be toast. These newcomers have a very tricky test ahead of them: How will they show individuality and authenticity, yet still celebrate the single best day of their — and their families’ — lives? 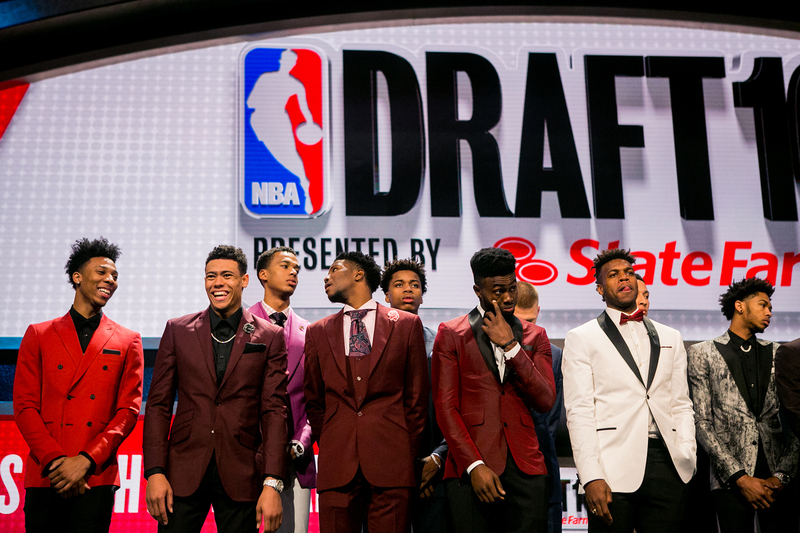 The NBA draft is like a high school prom. Months of plotting, planning and stressing over details go into both, except the gargantuan man-children are almost guaranteed to keep the girl, the nice car and the cool clothes when the night’s over. There were two fashion shows going on simultaneously. Mamas, aunties and girlfriends — the XXXL village that it takes to raise an NBA star — were all kitted up along with the draft prospects. Barbers and hairdressers had been called, and a few credit card companies may have been forewarned about impending Neiman Marcus and Nordstrom charges. Left: NBA draft prospect Malachi Richardson before heading to the NBA Draft at the Barclays Center New York, New York. Right: His Louboutins. Skal Labissiere greets fans at the Grand Hyatt Hotel before heading to the NBA Draft. NBA draft prospects Malachi Richardson, Wade Baldwin and Malik Beasley. A few players, such as Denzel Valentine, Kris Dunn and Buddy Hield found retailers who not only provided their suits, but dressed their parents as well. Hield was drafted by the New Orleans Pelicans at No. 6 in the draft, and worked with the J.C. Penney tailors to add a special something to his jacket lining. “I was repping my Bahamian roots with the Bahamian flag in there,” he said. Left: Timothe Luwawu greets fans before heading to the NBA Draft at the Barclays Center. Right: Brandon Ingram is selected as the No. 2 pick during the NBA Draft at the Barclays Center. Duke’s Brandon Ingram, the No. 2 pick in this year’s draft, wore a gray silk jacket with an abstract pattern and black lapels by Elivee. 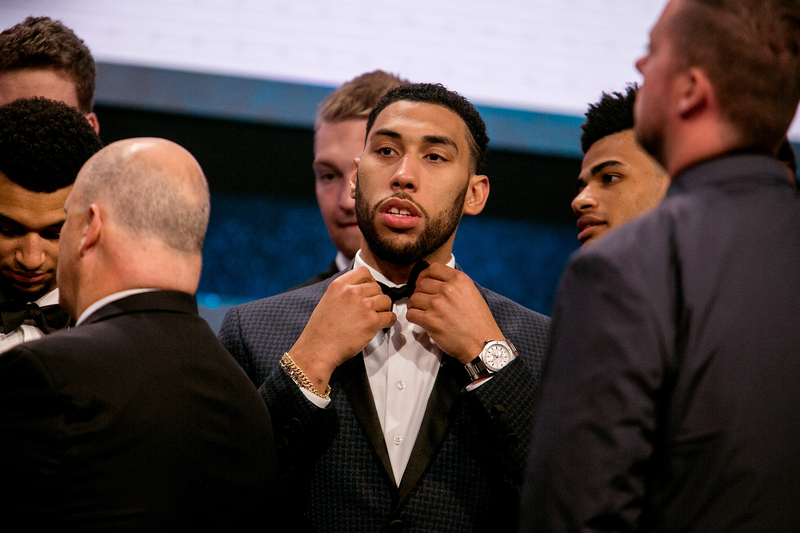 Denzel Valentine straightens his bow tie prior to the NBA Draft. Valentine, whom the Chicago Bulls selected with the 14th pick, said he takes fashion cues from the pros currently in the league. “Social media has been such a big part of why people can learn about what looks good. If you see someone on Instagram or Twitter like LeBron [James] or Steph [Curry], it gives you an idea of how to put things together. Everyone kinda clowns on him a little bit, but I like [Russell] Westbrook’s style. He’s fearless, and you can tell he doesn’t care about that you think, which is kind of how he plays,” he said. NBA draft prospects pose for photographs prior to the NBA Draft at the Barclays Center New York, New York. The NBA has produced and celebrated some of the trendiest dressers in the known world. Some of the past suits were good and others just weren’t — and not in a “hindsight-is-20-20” kind of way, either. 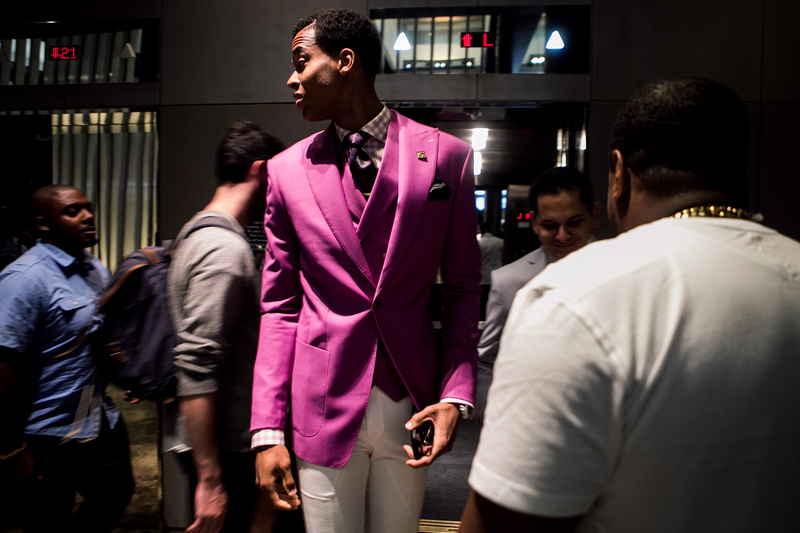 Those draft-day suits have earned a flashy place in fashion history as colorful “Sunday best” attire for supertall young men, many of whom were not born into or raised with money. Now the 2016 class has successfully added themselves to a roster of stylish stars. If you like color, texture, bling and swag, AND you can play ball, there’s room at the table. And this year’s draftees have certainly carved out a spot for themselves. 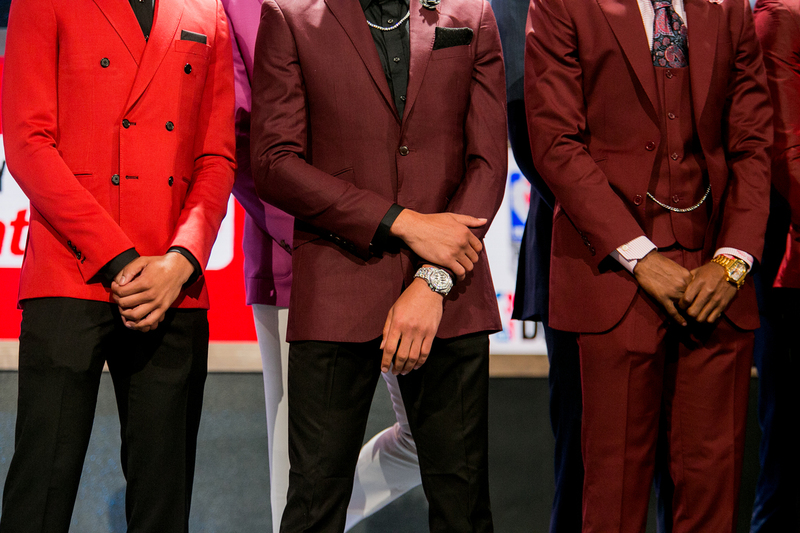 View a full gallery of the fly looks from the 2016 NBA Draft.